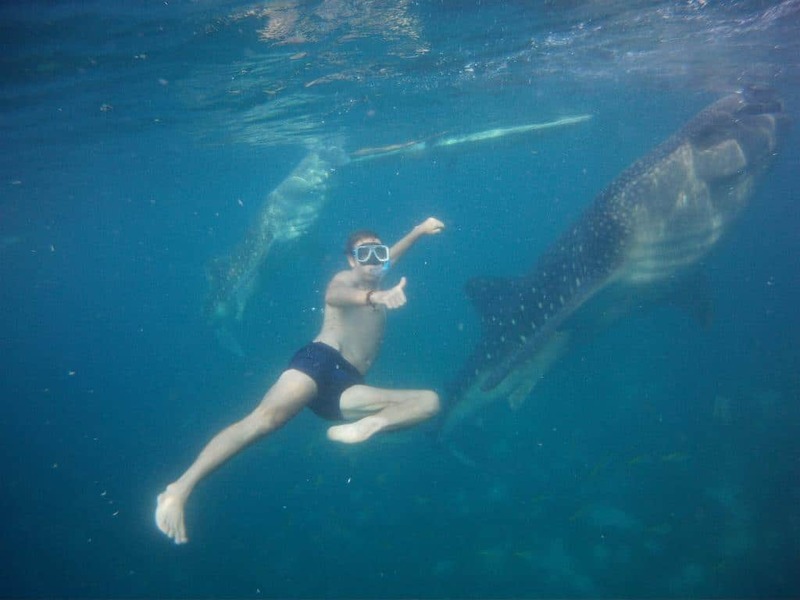 How to do the Whale Sharks in Oslob? During our travelling adventures we got to experience a once in a life time opportunity to swim with the Oslob whales sharks, Philippines. There aren’t many places in the world where you can freely swim with these gentle giants in the wild. There is a lot of controversy around the whale sharks in Oslob. Let me put this out there, we are totally against animal cruelty. However, we don’t see this as harming the whales. Everyone is respectful of them and the workers make sure you cant touch them or harm them in anyway. It is a managed and perfect experience. 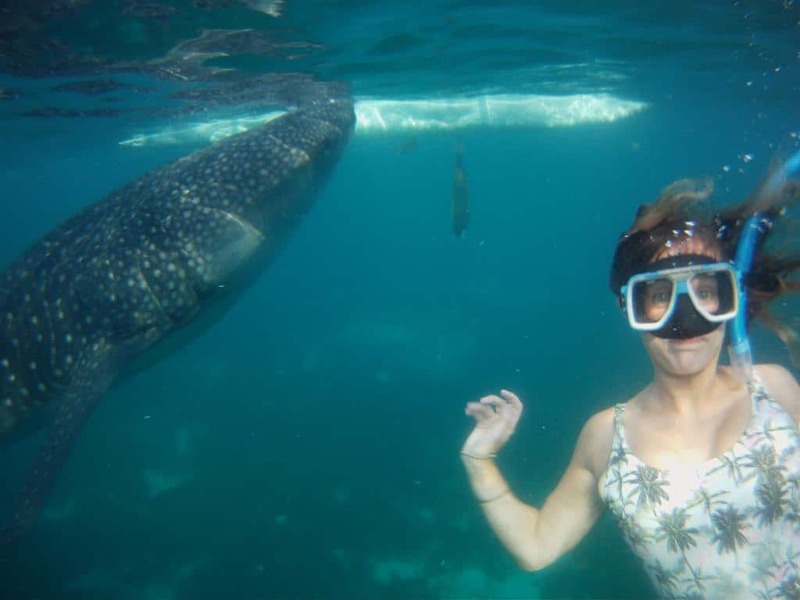 Swimming with whale sharks is one of the best things to do in Oslob. 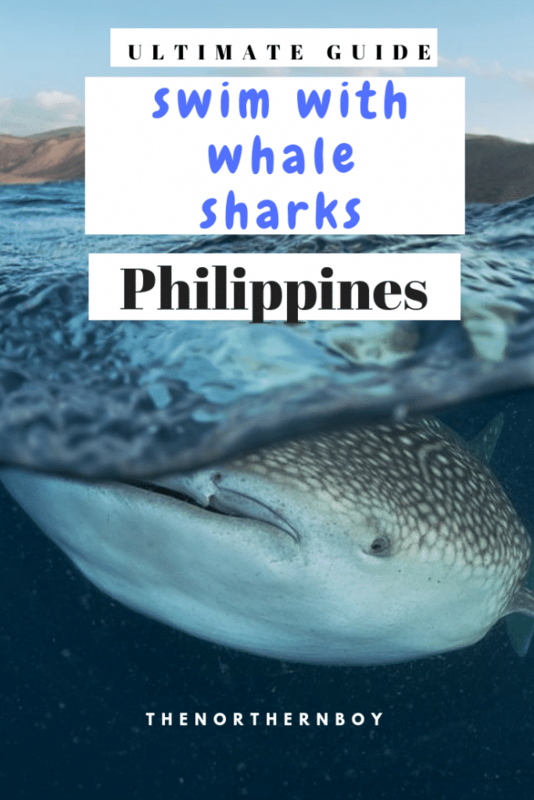 This post will share with you our experience of swimming with whale sharks and give you top tips when staying in Oslob. What are whale sharks in Oslob? Whale sharks hold the title of the world’s largest fish and can grow up to 32ft and weigh 200 tons, now that seems scary right? You’re wrong, these graceful creatures won’t be interested in eating you for lunch, as their favourite meal is plankton and lots of it! The whale shark is a filter feeder, meaning they swim with their mouth wide open and collect plankton and small fish before filtering out the unwanted salt water. Preferring tropical waters, whale sharks tend to be found is tropical waters, making Philippines an ideal place to call home. These enormous whales pass through Oslob and this is where you will have the chance to swim with these in a surreal setting. 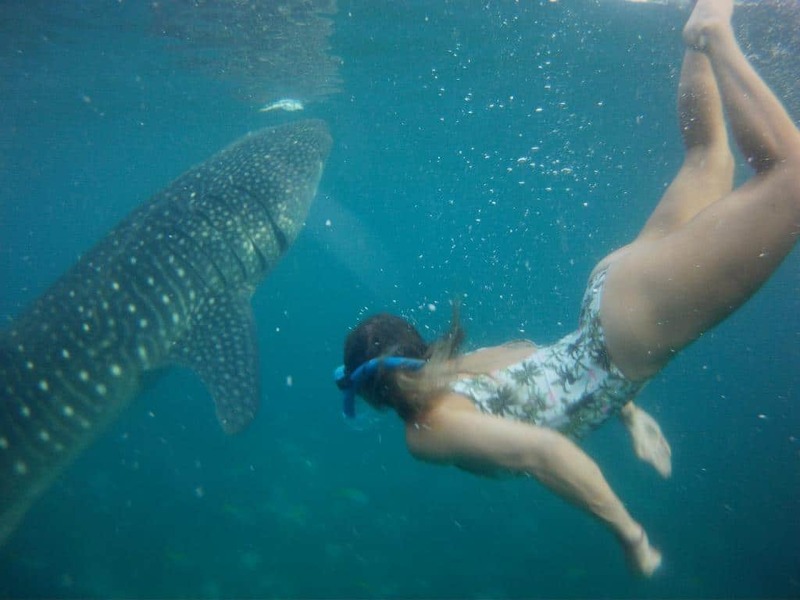 How much is Oslob whale shark swimming? The whale shark in Oslob cost is (1000 Peso), which is equivalent to (19 USD). 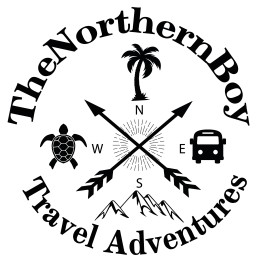 This included the hire of snorkels and life jackets, as well as our return transport to the whale shark site from our hotel and 25 minutes in the water. The money generated goes towards regenerating the community in Oslob which was once a quiet town, however there are now over 50 hotels employing a lot of people. How do you book whale shark swimming? We booked whale shark swimming the day before as we arrived in Oslob. Every hotel offers tickets so you won’t struggle to find somewhere to buy one. There also opportunity to book online @ Palawan activities. You can book through various tour operators in Oslob. 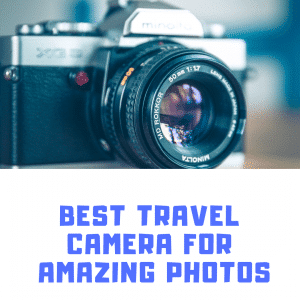 However, the usually best option is book through your hotel in Oslob. This is how we booked the whale shark experience. Also, the hotel provided our transportation to the Oslob activity. How to get to Oslob? Oslob is a small coastal town in South Cebu and is best known for whale shark swimming. You’ll be glad to know there is a 7/11 to pick up any essentials you will need and a few local restaurants to try some yummy Filipino food. The cheapest way to get to Oslob is to fly into Cebu, then catch as bus from the airport to the south Bus terminal. Once at the south bus terminal in Cebu City, catch a direct bus to Oslob. The buses aren’t always reliable so allow plenty of time for travel, however they are super cheap, costing around $1 USD per journey! Alternatively you could pay for a taxi to take you directly to Oslob which should take around 4 hours depending on traffic. Whale shark watching starts at 6am and finishes around noon. We were told to get there as early as possible as it can get busy, so after a 5am alarm, a quick breakfast we were ready to roll. The guy from our hostel drove us to the whale shark watching site and after signing in we had to listen to a 5 minute talk regarding the safety of the whale sharks and ourselves, as well as informative information about these incredible creatures. 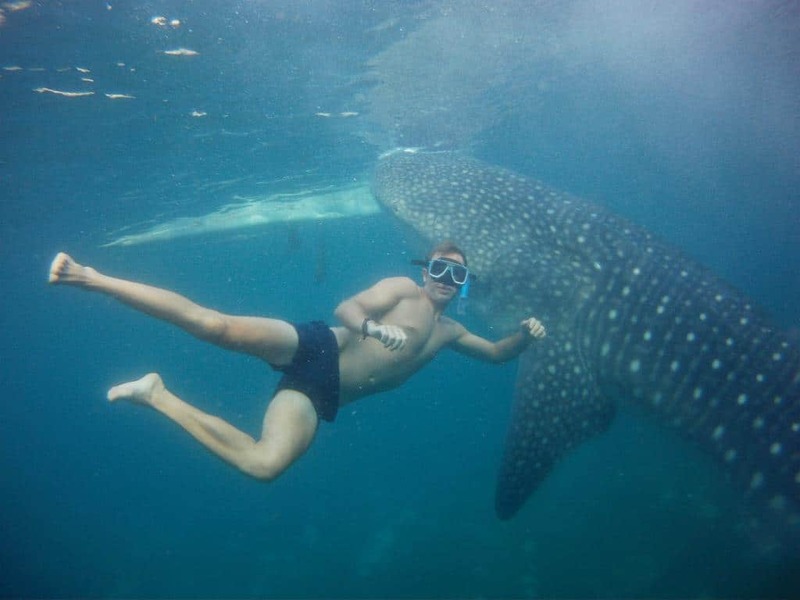 It was clear to see the organisation was strict on rules when swimming with the whale sharks and for good reason. For example under no circumstances are you allowed to touch the whale sharks or feed the whale sharks and you aren’t allowed to wear sun cream. It is purely an observational activity and everyone should respect this. We then collected our life jackets and snorkels and were allocated a boat with a driver. They also have Go Pro’s to rent for 500 Peso’s ($9USD) in case you don’t have an underwater camera. I would highly recommend doing this to capture those insta shots. The boats are quite narrow and fit 6-8 people in. The guys row you around 50 metres from the shore and all line up by the side of each other. They’ll signal for you to slide into the water and then simply watch, enjoy and swim alongside these gentle giants. The crew feed the whale sharks to entice them to come but I wouldn’t be complaining if I was offered free food! You get around 25 minutes in the water then we headed back to shore. Our hostel guy was waiting for us and off we popped back in his tuk tuk to the hostel. The whole experience takes around 1 hour. Insider Tip: From the whale shark feeding centre, ask your driver to head to Tumalog Waterfalls, it’s only 5 minutes away and is in the same direction back to Oslob town. Having travelled all over Asia where seeing waterfalls are a common thing, I can still say do not miss out on this one! The Tumalog waterfalls is a sight to see. This budget hostel has one of the best rated locations in Oslob, making it a perfect choice for those travellers who want convenience. With a shared lounge you’re bound to make friends on your adventures. The rooms are spacious and are cooled by a fan, but for that price you can’t complain! We were lucky enough to stay at this resort whilst staying in Oslob. On arrival we were met by friendly staff who showed us around. There’s a small pool to cool off in and a large restaurant serving fresh local philiphino food, which overlooked onto the sea, perfect for those beautiful sunset. Each room has air conditioning and includes a private bathroom with shower and the majority have a sea few. AJ’s offers air conditioned rooms, with a flat screen TV and private bathrooms. The staff are very accommodating and the facilities are superb, with free wifi throughout the property and breakfast available. The whale shark experience is definitely the best thing to do in Oslob. Like I said there is some controversy around this activity. 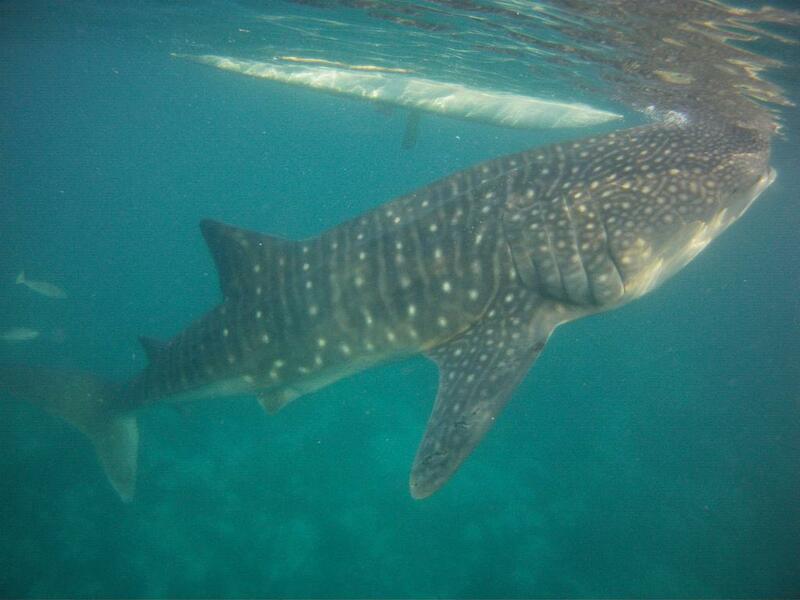 However, we did not see any harmful activities towards the whale sharks. 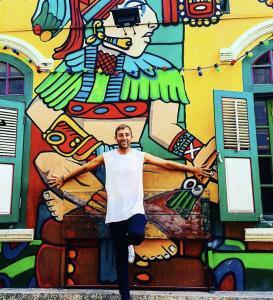 It is a really surreal experience and probably one of the best things we did in the Philippines. If you’re visiting Oslob, I would suggest to just stay for 2 nights.